Stuart Solomon (center), Public Service Company of Oklahoma president and chief operating officer, celebrates the Credits Count grant from the AEP Foundation with officials — including Oklahoma Gov. 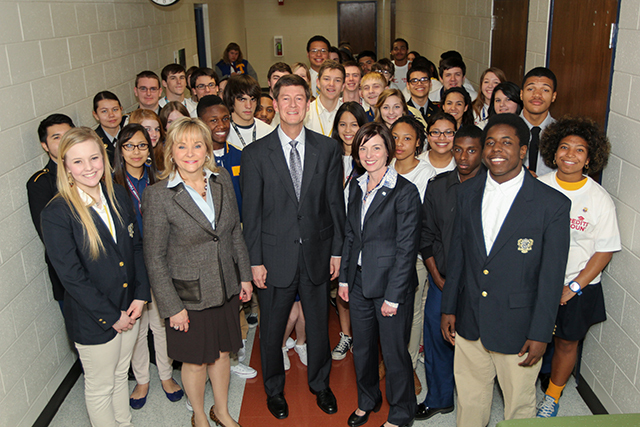 Mary Fallin (front row, second from left) and TCC President and CEO Leigh B. Goodson (front row, fourth from left) — and students Feb. 9 in Tulsa, Okla. The AEP Foundation will partner with Tulsa Community College (TCC) and the TCC Foundation to provide $3 million over five years to launch the Credits Countsm program, benefiting high school and middle school students in Tulsa Public Schools (TPS). The announcement of the program, which focuses on STEM (Science, Technology, Engineering, Mathematics), was made Feb. 9 during a special ceremony at Tulsa’s Will Rogers College High that was attended by local and state officials, including Oklahoma Governor Mary Fallin. Credits Count, a signature program of the AEP Foundation, will begin at Will Rogers College High School and expand to three additional Tulsa public high schools and include the middle schools that feed into them. TCC will work with students and their families to explore STEM fields, introducing students to careers they otherwise may never have considered as career options. Along the way, Credits Count will help students fill in learning gaps, so they are ready to study college-level courses while still in high school. By graduation, students will have earned credits that count toward a certificate in a STEM-related career or a college degree in fields that include engineering, biotechnology and information technology. Summer Bridge Programs – providing remediation in English and math and improving skills prior to students’ participation in dual enrollment programs. TCC will facilitate the dual enrollment program in cooperation with Tulsa Public Schools. The program will reach nearly 1,000 students to assess college readiness. About 800 students will participate in the Summer Bridge program to improve math, science and English skills. About 3,000 middle school students will participate in a summer STEM college experience and up to 800 students will receive for-credit college-level course work, while completing high school. Fallin expressed her appreciation for the leadership of all the partners involved, and added that initiatives like Credits Count will help set a standard for others to follow. TCC is the third college to receive funding from the AEP Foundation for a Credits Count program. The first two were Columbus State Community College in Columbus, Ohio, and Bossier Parish Community College in Bossier City, Louisiana.